Transport for London (TfL) has signed a new seven year sponsorship deal with Santander, worth £7.25m per year. “As everyone knows, London buses, phone kiosks and post boxes are red. In Santander Cycles, we have a new red icon symbolising the Capital to Londoners, and the world. 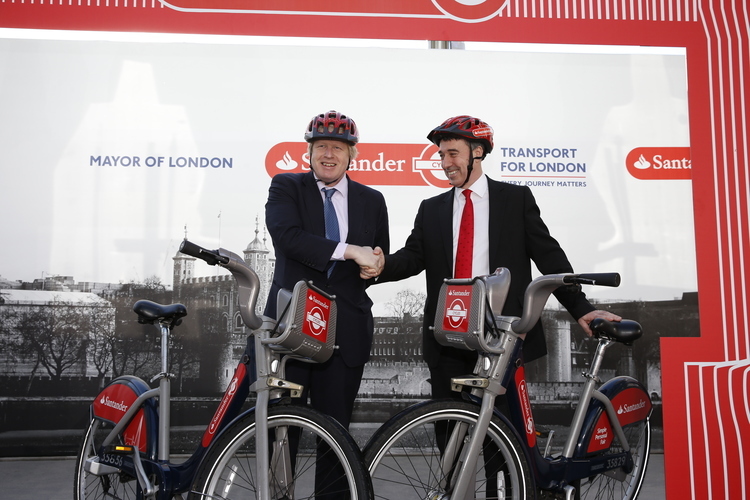 Santander’s marketing expertise will help us take the Cycle Hire scheme to a new level, and I am thrilled to welcome them. The Santander deal is just £2m more than the £5m Barclays put in — and many believed that was too one-sided — so will £7.25m be considered to be too cheap? While it's likely that City Hall and TfL have learned some lessons from the furore surrounding the Barclays sponsorship, their choices may have been somewhat thin on the ground — both the New Year's Eve fireworks and free tube travel failed to attract sponsors. Like its predecessor, Santander has also came in for criticism over its suitability as a sponsor. A Greenpeace investigation exposed the bank's loans to April, a paper company accused of damaging rainforests in Indonesia and the bank has since made the timely decision to withdraw its funding. “The extra money is good news for cycling in London, although there are genuine concerns over some of Santander's international activities and its suitability as a sponsor. The Mayor should be using the extra money to review the whole way that cycle hire works. There are still complaints about over-charging and the lack of compatibility with Oyster or waive and pay. The biggest complaint is over cycle hire missing out large chunks of inner London. The Mayor needs to look at expanding the scheme further northwards and to address the big gap in coverage south of the river." The cycle hire scheme is being rolled out across the capital, with eight new docking stations due at the Queen Elizabeth Olympic Park this year and potentially up to 1,000 locations by early 2016.